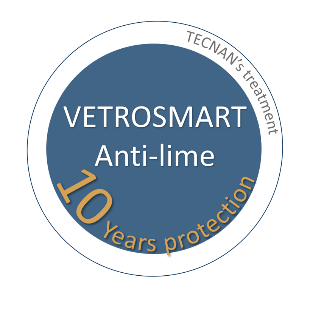 Surface treatment for glass – TECNAN-NANOMAT "Think big, Act Nano"
VETROSMART is a transparent, hydrophobic and anti-lime solution, specially designed for glass surfaces: shower screens, mirrors, windows and glass curtain walls among others. This treatment provides the glass with easy-to-clean properties creating a protective barrier against liquids, lime and other dirt stains, therefore preventing its accumulation and reducing the subsequent cleaning tasks. -Certified durability of 10 years based on a very complete procedure of accelerated aging tests consisted of UV aging, chemical attack, thermal shock and abrasion tests. -Easy to clean: it reduces cleaning times substantially. -Keeps surfaces clean for a longer time, maintaining the original appearance. -Permanent protective barrier against corrosion, limescale, dirt and resistant to UV radiation. -The coating results totally transparent, not modifying at all the aesthetic conditions of the glass. -Applicable to both new and existing glass. -Easy to apply product, without the necessity of special safety measures. -Ultra-fast drying after the treatment, avoiding cumbersome spots on further handling. -It presents high features and high performance (60m2/Litre approximately). 1 – VETROSMART: Hydrophobic protector of optimum performance; alternative of maximum quality. Certified durability of 10 years in new glass. 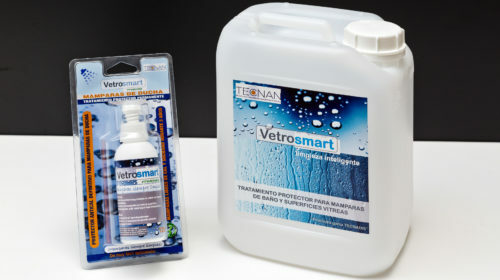 2 – VETROSMART Economy: Hydrophobic protector of excellent features; great alternative in relation quality-price. Durability of 5 years in new glass. 3 – VETROEASY: Hydrophobic protector of good features; alternative which offers good features at the lowest price. Durability of 3 years in new glass. 125mL, 1L, 5L y 25L.